Loktak Lake is a unique wetland and is listed as a wetland of International Importance through the Ramsar Convention treaty. 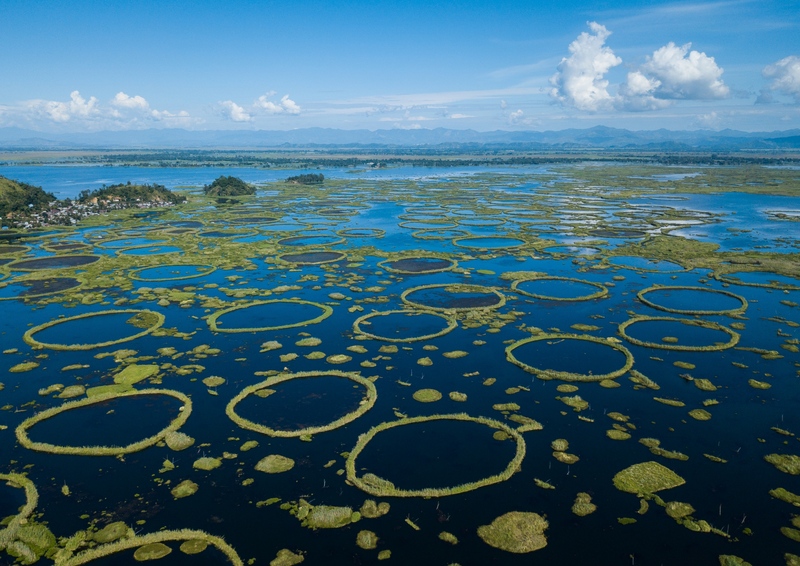 The lake is distinctive due to the numerous green floating biomass (phumdis) that covers nearly two-thirds of the lake’s 236 square kilometers. Phumdis or floating islands are comprised of vegetation, soil, and other organic matter. They change shape and size, moving around the lake surface depending on the season. The phumdis play a critical role in water cleansing, nutrient absorption, flood control, and carbon sequestration. Phumdis are home to some 425 species of animals, including the endangered “dancing deer,” over 100 species of birds, and over 200 species of aquatic plants. Loktak Lake is home and means of livelihood to indigenous (Meiteis) families that live on Phumshangs. Some 30,000 fisher folks fish the lake. Over 100,000 people depend on the lake directly and indirectly for food and livelihood. The lake is of immense cultural, social and economic importance to some 55 communities that surround the lake. This photo essay documents how the Ithai hydroelectric dam, infrastructure projects, regional armed conflict and climate change threaten this unique ecosystem. 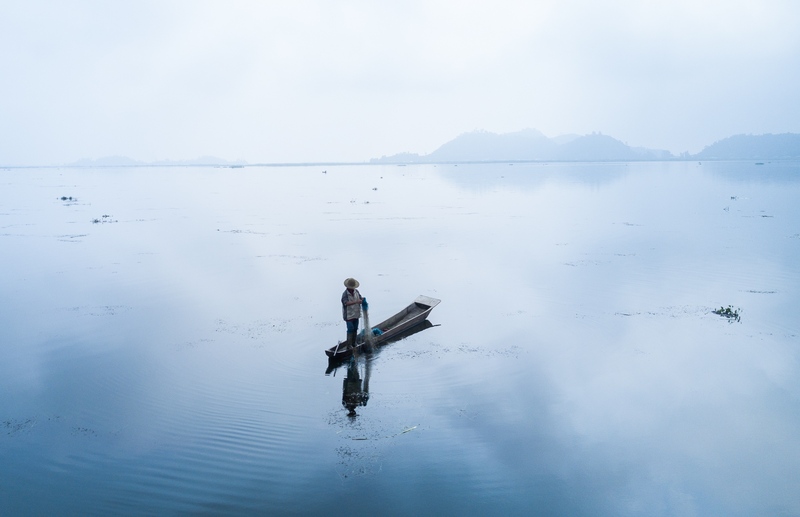 A Meitie fisherman fishes in Loktak Lake, Manipur. The construction of the Ithai Dam flooded over 80,000 hectares of farm and pasture land in the vicinity of the Loktak wetland. 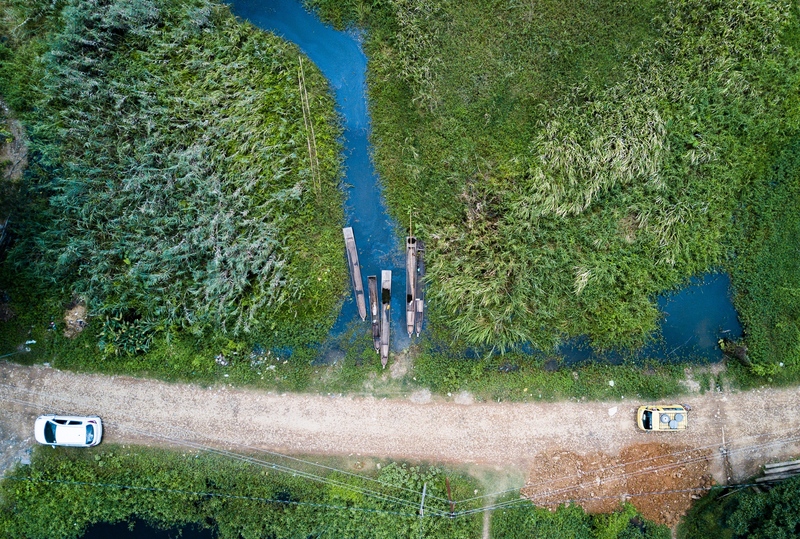 The Loktak Development Authority has been dredging the phumdis (floating biomass) and has cleared over 800 Phumshangs in the name of lake clean-up for efficient power generation. A view of Phumdis (floating biomass/ islands) inside Loktak Lake, Manipur. The Loktak Development Authority (LDA) has dredged most Phumdis and Phum Shangs (Floating huts) in the name of lake cleanup. Ibomcha Singh examines his catch of Fabou nga (a native fish) that he fished using Burmese fishing net in Loktak Lake. The construction of the Ithai Dam altered the hydrology of the lake, impacting the breeding process of native fish species, forcing fisherfolks to change their fishing techniques. 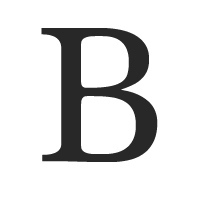 Numerous native fish species have disappeared from the lake. 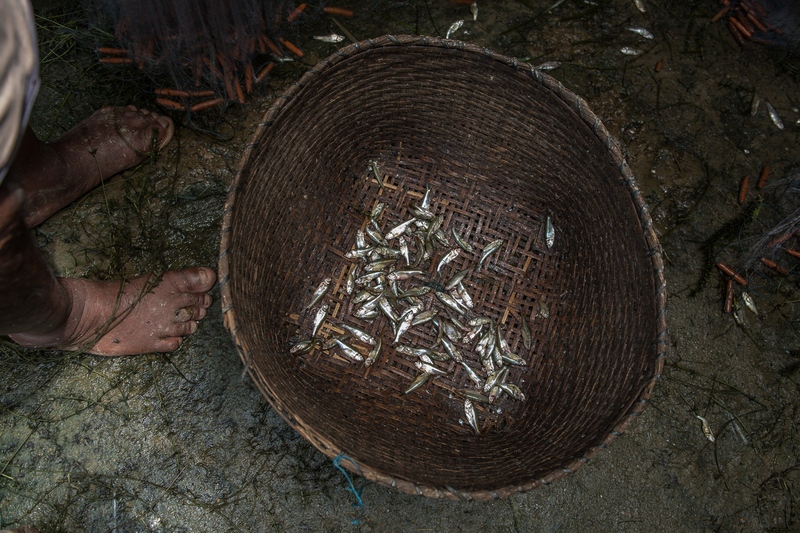 Mukha nga (non-native fish) that were fished from Loktak lake sit in a basket at the Laishram family home in Thanga. After the construction of Itahi Dam when the native fish populations in the Loktak Lake began dwindling, the state fisheries department introduced numerous non-native fish species to the lake. 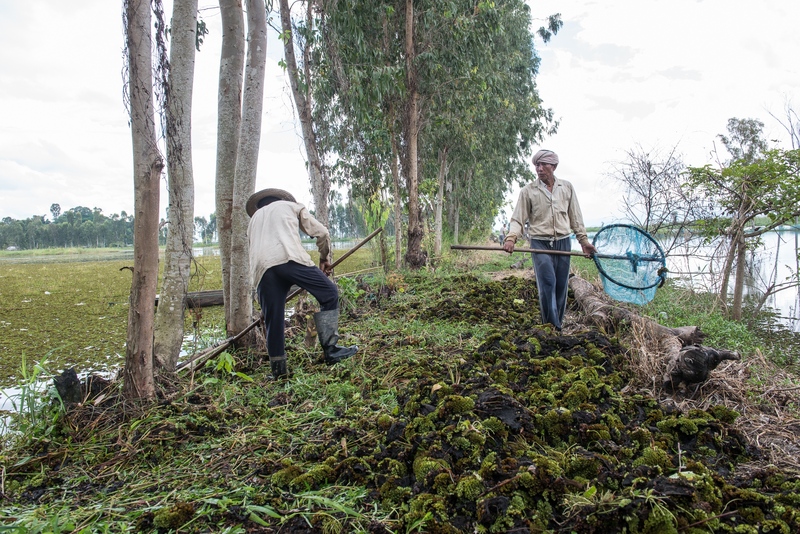 Indrajeet Tombram (left) and Haobijam Manihar perform the backbreaking task of dredging out weeds that had proliferated on a fish farm in Loktak Lake. Increased erosion and use of fertilizer along with altered hydrology due to the commissioning of the Ithai Dam have resulted in increased rates of eutrophication. A view of Athaphums which are human-made fish culture ponds for shallow water fishing in Loktak Lake. After the construction of the Ithai Dam, water levels in the lake rose, severely impacting fishing in Athaphums. 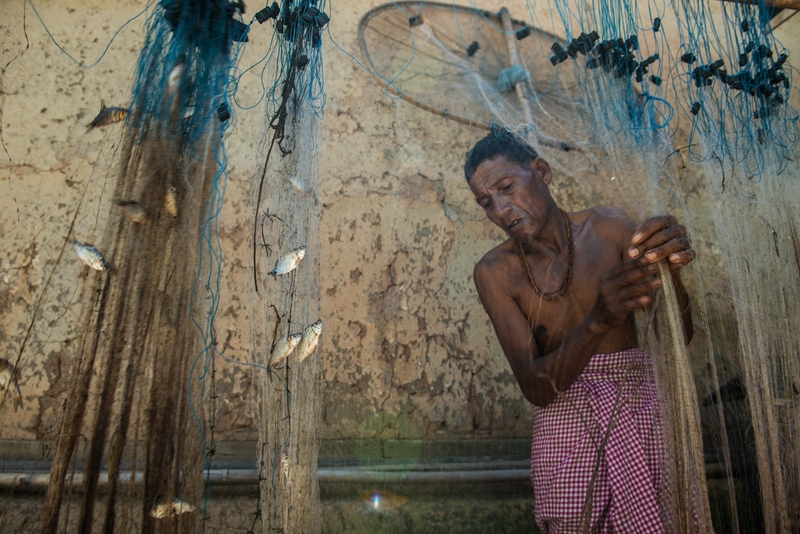 Consequently, some fishermen began using pesticides to kill fish; the practice has now declined. Ningthoujam Ongi Shanti poses for a portrait along with her granddaughter Baby Naidya in the village of Thanga. In March 1999, the Indian Army conducted an anti-insurgency operation around Loktak Lake during which Shanti was wrongfully taken into custody by law enforcement. Areas surrounding Loktak have been used as hiding grounds by insurgent groups which has intensified the militarization of Loktak Lake. Priests perform a traditional Metie ritual called Tarpon which is an annual offering to honor the memory of the ancestors. 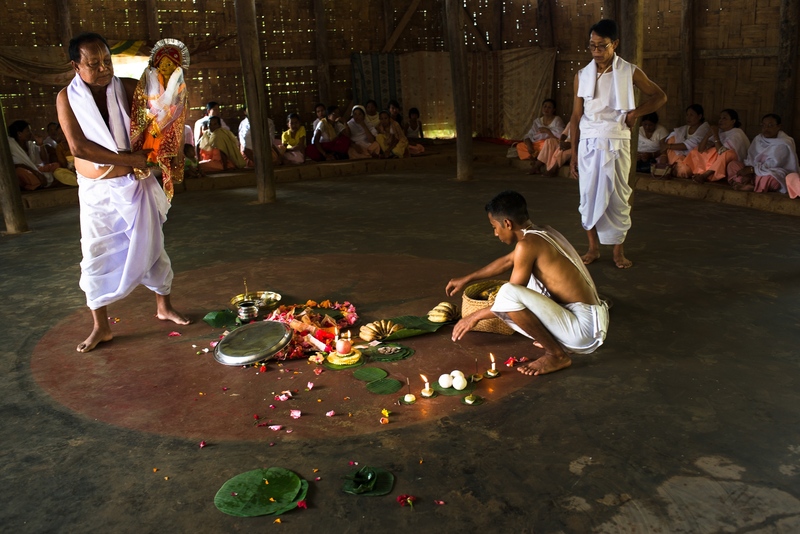 Several vegetables and fish used in the traditional worship come from the Loktak lake and have become near extinct in recent years. 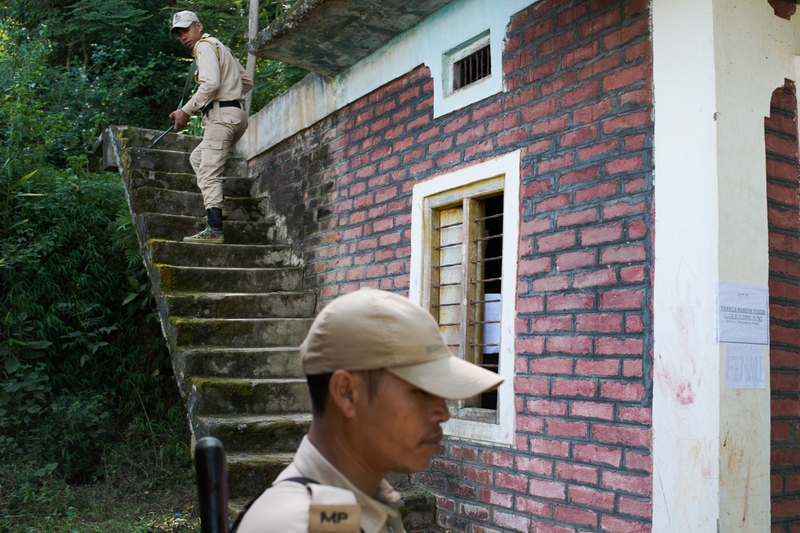 Security forces patrol a school at a school in Thanga village prior to polls. 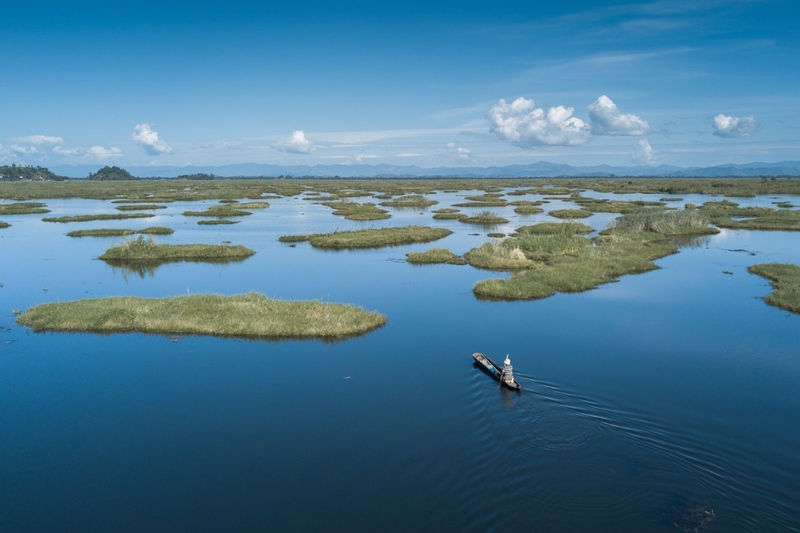 Areas surrounding Loktak have been used as hiding grounds by insurgent groups demanding a separate nation which has intensified the militarization of Loktak Lake. Vehicles drive along the dusty high road that circles the Lokta Lake. The government wants to convert it to a paved ring road to draw tourists. Some local activists oppose the ring-road as well as several other tourism-related infrastructure projects that they consider threats to the wetland. Over the years indigenous people have been evicted for tourism and infrastructure projects without consent and appropriate compensation. 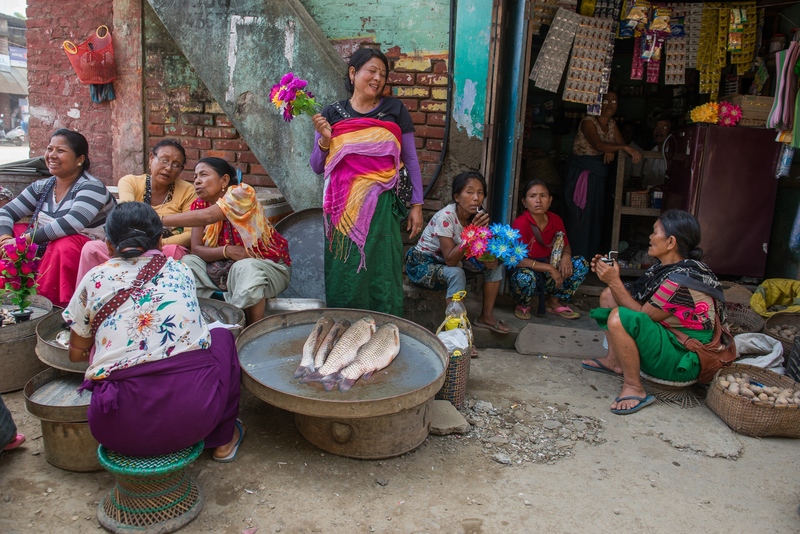 Fisherwomen and vegetable vendors wrap up business for the day in the Ema market in Ningthoukhong, in Manipur. Recurrent floods during monsoon season continue to impact fisheries and vegetable harvest in the area. In August 2017, the state Chief Minister Biren Singh formally urged Prime Minister Narendra Modi to consider the decommissioning of the Ithai Dam as a permanent solution to the ecological disaster. 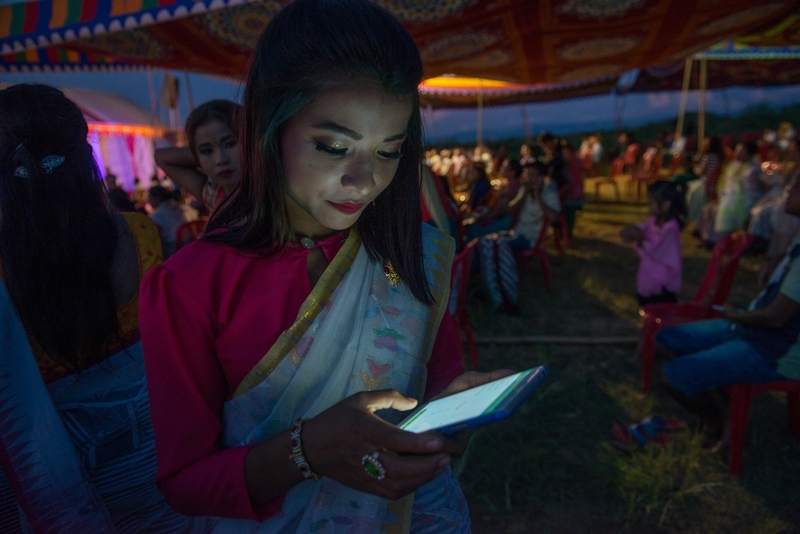 Echan, a teenage performer at the Loktak Day festivities held in the village of Thanga, Mainipur swipes her phone. The younger generation in communities surrounding Loktak is moving away from the traditional livelihood of fishing because making a living from fishing has become challenging. 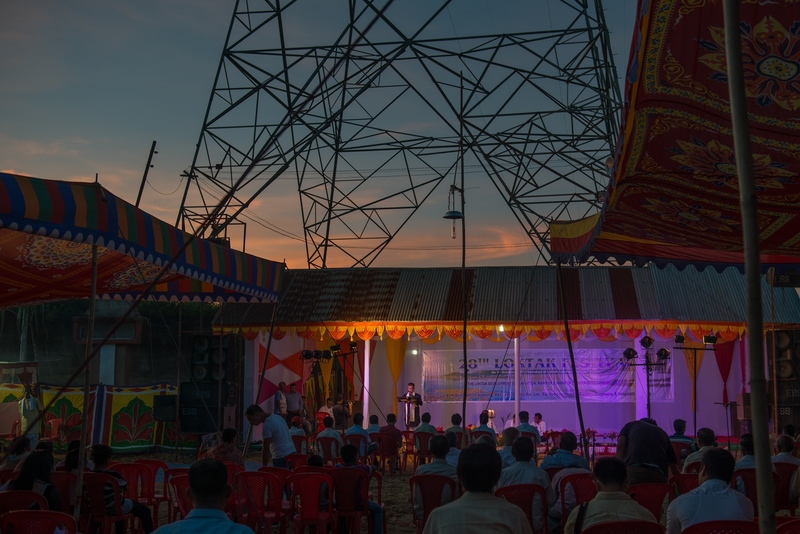 A government official delivers a speech at the 2017 Loktak Day celebration, emphasizing the conservation of the Loktak Lake. The 105 MW, Loktak Hydro Power Project, commissioned by the government in 1983 for power generation and irrigation has not only been underperforming but has also resulted in an ecological disaster in the Loktak Lake and impacted the livelihoods of over 30,000 fisherfolks.